It is seen that, the e.m.f. induced in the conductors is always sinusoidal and commutator converts this sinusoidal e.m.f. to unidirectional e.m.f. Let us see, how it happens. For simplicity of understanding the commutator action, consider commutator in its simplest form. Commutator is divided into number of copper segments insulated from each other. In its simplest form, it is assumed to be divided into two segments, each is nothing but the half of the entire commutator drum, separated by insulating material. 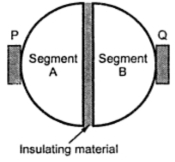 So in its simplest form it is a ring with two halves separated by insulation as shown in the Fig. 1. Such a ring is called split ring. The brushes P and Q are stationary and pressed on the surface of split ring. Split ring is mounted on the shaft and rotates as armature rotates. 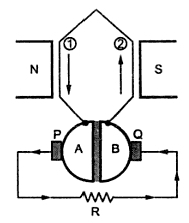 Consider a single turn generator with conductors (1) and (2). 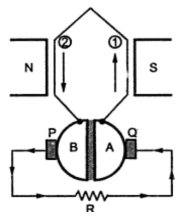 These armature conductors are connected to the two segments of split ring. The external resistance R is connected across brushes P and Q. Under instant 1, the current flowing through resistance R is flowing from left to right as shown in the Fig. 2. This is by assuming the direction of current through conductor (1) downwards which is under N pole and through conductor (2) upwards which is under S pole, at the instant considered. At this instant brush P behaves as positive and Brush Q as negative. After a next half revolution, we have seen that direction of e.m.f. in the individual conductors reverses. Hence conductor (1) now will carry a current which will be upwards and due to half revolution it will be under S pole. Similarly conductor (2) individually will carry a current downwards now, and will be under N pole as shown in the Fig. 3. Now split ring i.e. commutator is mounted on shaft and rotates with armature. So when conductors will reverse their positions, the split ring sections will also reverse their positions as shown in the Fig. 3. But brushes P and Q are stationary and tapping the current from the commutator segments which are in contact with them. Hence under instant 2, segment B will be in contact with brush P and segment A will be in contact with brush Q. Due to this, current through resistance R maintains its direction from left to right as shown in the Fig. 3. Brush P remains positive and Q remains as negative. The Fig. 4 shows the waveforms of current in the individual conductor and current in external resistance R. Effectively one brush always taps those conductors. carrying a current which is in 180o opposite direction to the conductors under brush one. So one brush remains always positive and other always negative, and the load current is unidirectional. Note : In the limiting case, number of segments of a commutator is equal to number of armature coils in a practical generator. Due to this, commutating action is very fast and almost straight line i.e. pure d.c. can be obtained across the load. In a practical d.c. generator, the small poles in addition to the main poles, fixed to the yoke in between the main poles are used to improve the commutation. These poles are called interpoles.